An XPFalcon is your friend in the shed. The XP series was released in February /March 1965, and were produced till August/ September 1966, 70,998 were produced. From the earlier XM the XP a squared off front was prominent. In 1965 the Fairmont was introduced. Styling on the XP was flat straight through appearance; the front fenders, bumper and engine hood were 1960/63 US Comet as well as the dash. The XP used a locally designed grille with single headlamps (the US Comet always used quad lamps). There was a flat grille with new design mesh work, the front bumper was modified to wrap around to wheel arch. A flat bonnet replaced the dummy air scoop on the bonnet was dropped from the XM and new badging was used. Underneath, the Ford Engineer’s had beefed up the torsional stiffness by adding Fairlane type ‘Torque boxes’. These were chassis type frames, which were welded to the body structure. The car was longer by 0.3” then the XM, also the Coupe weight up by 50lb on the sedan. The XP Falcon was available as 4 door sedan , Deluxe sedan , a Station Wagon , Deluxe Station wagon , Deluxe Utility, Utility and Panel van. During 1965 2,608 coupes were produced with a further 1,227 in 1966, but the 1966 numbers may not be accurate. Around 10% were sold as coupes. In September 1965, two models were added to the model line up, the Fairmont was to replace the Futura (March to September 65)Sedan and the Squire Wagon. While the Futura name continued with the Hardtop model, the unpopular Squire was dropped, it did not sell well and was one American idea (side panelling in false wood and fibreglass) that Australian buyers did not like. The Fairmont was aimed at providing competitor to Holden’s Premier and Chrysler’s Valiant Regal. It came with 14” wheels, low profile tyres, power assisted 10 ¾ “ Girling disc brakes, fully adjustable, reclining bucket seats, reversing lights, padded console bin and fascia and rear seat centre armrest. It was available with only an automatic and the Super Pursuit 200ci engine. Interiors on the Fairmont were initially all black and prices were $3050 for the Sedan and $3250 for the wagon. There was a Fairmont Sedan and Fairmont Wagon. The XP was the last in the XK, XL, XM series, spanning 6 years. During this time, Ford had progressed from 4.1% penetration to 10% (Falcon 1960 – 1965). Sales in 1965 topped 45,475 units, up 4118 vehicles on the previous year. 1966 was to be Ford’s turning point in the race for market leadership. The XP won the wheels magazine ‘Car of the Year’. it was the first Australian car to be considered and win the coveted Award. The magazine said at the time, “The XP has won the award mainly on the grounds of seriously applied development engineering to improve a basically poor (XK – 1960) product.” This is amazing considering Bill Bourke was one of the few supporters of the Falcon, in fact they almost re-named it in 1965 as Aussies though Falcons were so unreliable! 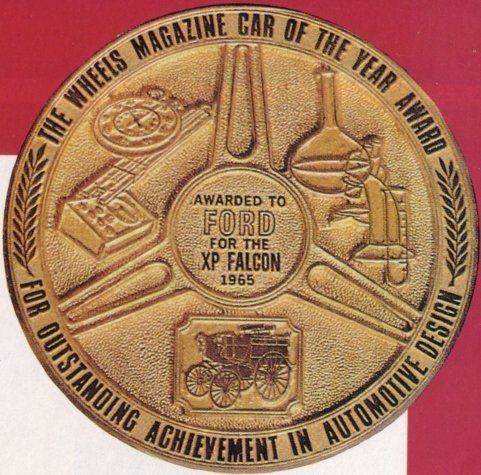 “After long and careful deliberation, Wheels magazine has awarded its Car of the Year award to the Ford Motor Company of Australia for its Falcon XP series. The Falcon is the first six cylinder car to win the coveted trophy, the first of the American-backed “Big Three” to figure, and has the highest local content of any winner so far. The option list was now growing, laminated windscreens, disc brakes on the Fairmont and lastly a choice of three-speed automatic transmission or the original two-speed Fordomatic. power rear windows on wagons (standard on the squire – the ill fated woody wagon), tinted windscreen, fashion pack (full carpets, woven fabric seat inserts and arm rests), washers and heater/demister as well. All the production build options are detailed on the VIN. The XP stoped the horsepower race, the 200ci engine was now only available with a automatic transmission. The autos were now either Ford’s own Fordomatic 2 speed or the Borg Warner type 3’s, known as the Fordomatic 3s. The engine/transmission combinations were rationalised on the XP models, the 2 speed being available only on the 170-pursuit engine and the Borg Warner 3’s as optional. The ‘s’ speed was introduced to gain additional local content, which was a government initiative, and the 2 speed was eventually phased out. During testing on the XM there was a third party selling XMs with a 289 V8 as Ford new car, but this was knocked on the head! The XP was a big improvement all round, minor changes to handling, front and rear suspension were revised, engine, dash layout and seating comfort again showed Ford was listening to their customers critics and were prepared to act and remedy any shortcomings. The XP was essentially what the XK should have been. US Ford Engineer A.I. Sunberg said in 1965, “The XP, I guess, existed as an objective in 1959.” Credit for the success of the XP’’ engineering went to Ford’’ chief engineer, Jim Martin. Did anyone ask for Ute brochure ? The XP Falcon durability run–some pics !